By 2050, the San Diego region is projected to grow by an additional one million residents. As the region urbanizes, it will continue to confront challenges associated with growth. A key issue has been – and will continue to be – how to successfully integrate newer housing stock into our communities in order to meet projected demands. Across the region, however, various communities have shown an aversion to taking on the “D”-word…density. For many members of the public, the term “density” can elicit a visceral negative reaction by evoking images of poorly designed buildings with a lack of regard for community character. 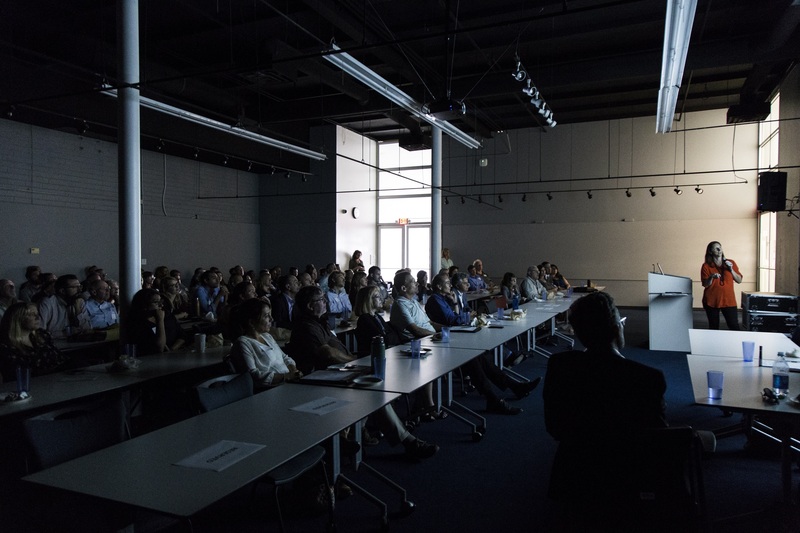 On September 14, 2017, planning and design professionals assembled at the NewSchool of Architecture + Design for the San Diego Section of the American Planning Association (SDAPA) luncheon to discuss key issues related to design and density, including the role that design can serve in successfully integrating more housing into our existing neighborhoods. 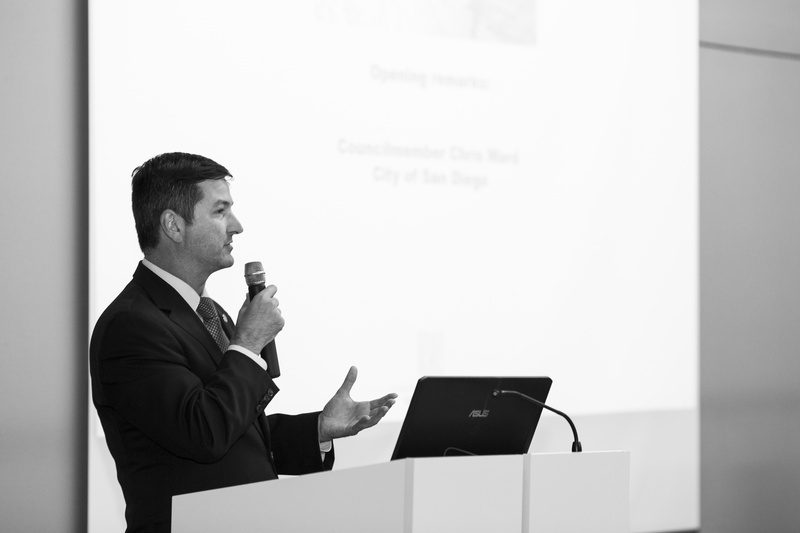 City of San Diego Councilmember Chris Ward, who has a background in planning, gave opening remarks. He cited the particular importance of design and density to the communities that he represents, which include the Uptown and North Park areas; two communities which have recently adopted updated community plans and are experiencing significant levels of infill and redevelopment. 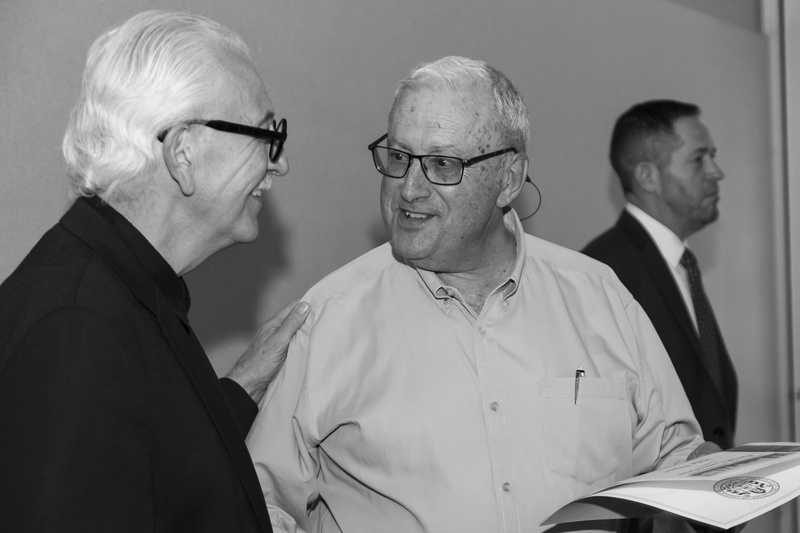 Councilmember Ward also took a moment to pause and recognize the lasting contributions of Mike Stepner, FAICP, FAIA, and former City Architect to planning and design in San Diego. Mr. Stepner’s work has been monumental in creating some of the great places that we admire today, such as South Park (take a look at the 1987 revitalization plan here, which was raised as an example that Mr. Stepner and many other planners have advanced policy for decades to address design and density). Councilmember Ward provided Mr. Stepner with a special Commendation. Nick Ferracone, AICP, SDAPA Programs Co-Chair, assembled the event and coordinated presentations from local experts, including Wendy L. Tinsley Becker, AICP, RPH (Urbana Planning and Preservation); Diego Velasco, AICP, LEED AP (MW Steele Group); and Frank Wolden, Principal (AVRP Skyport Studios). Mr. Ferracone also moderated the panel discussion that followed. Ms. Tinsley-Becker established the historical context for growth in San Diego and provided an overview of the City of San Diego from its humble beginnings to the development of first, second, and third ring suburbs (such as Linda Vista, Clairemont, and Mira Mesa, respectively) to the current trend of infill and redevelopment. As a historic preservation specialist, Ms. Becker’s perspective on growth is unique. She cited that while growth is essential and necessary to the health of our cities, we should also seek to acknowledge the existing context of our communities when we move forward with infill development. She suggested various measures that planners can take to ensure the sensitivity of development to its surroundings, including adopting design guidelines. Mr. Velasco pointed out that we’ll “travel thousands of miles to experience great places” – such as the beautiful piazzas of Italy – when we are capable of creating great places locally by embracing similar principles. We can positively leverage density and pay attention to the elements of building design, such as the treatment of bulk and mass, heights, and frontages. Mr. Velasco provided an overview of some of the concepts under consideration for the Mission Valley Community Plan Update, including how to break down and integrate the massive “superblocks” that dominate the area, demonstrating the possibility of retrofitting existing areas to achieve highly-livable mid-density neighborhoods. Overall, he emphasized the need to look beyond individual projects and see how groups of buildings collectively shape a sense of place. 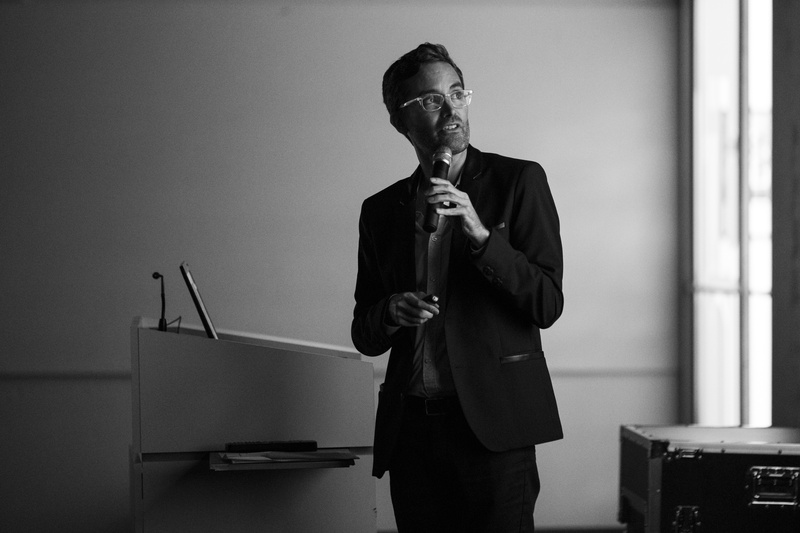 Mr. Wolden concluded the panel with a presentation entitled “Creative Infill.” He specified key concepts in the design of cities, which include giving enough consideration to scale, creating expectations, and urban flow. 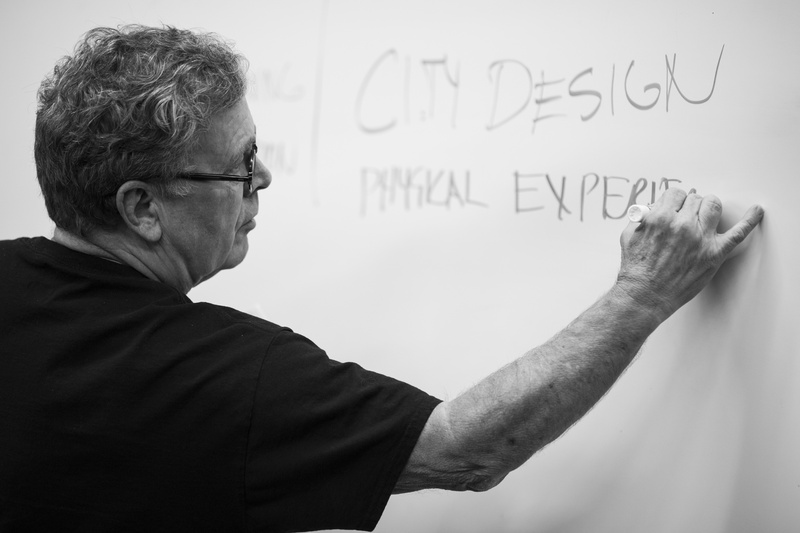 He provided examples which included an “evil doughnut hole” and a project which utilized asymmetrical pedestrian accesses to create a more interesting human experience (spacemaking as placemaking), and also shared what San Diegans may see in the redevelopment of Seaport Village. 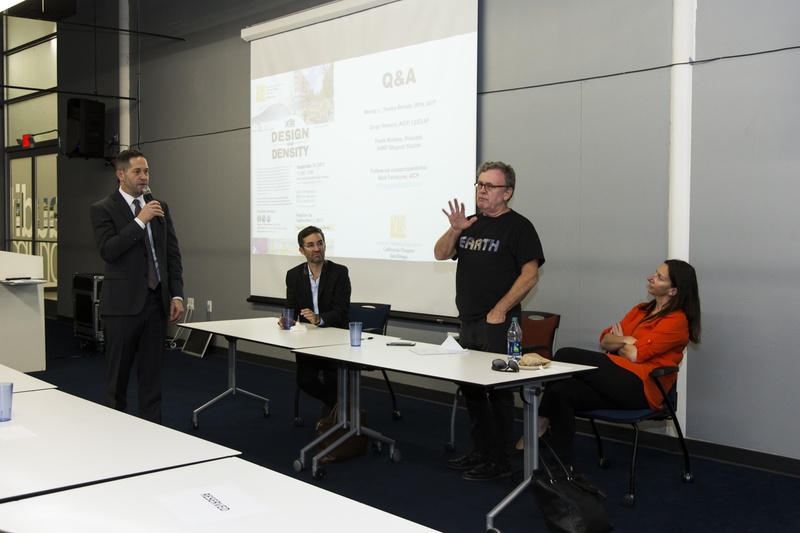 In the question and answer session that followed, attendees voiced concerns regarding the political realities of processing projects, which often detract from the ability and resources to focus on design issues. The panelists responded that some municipalities are establishing design studios and others are providing more design training for staff. There was agreement that professionals with multi-disciplinary toolsets could present special value in this area. Like any good panel, more questions were raised than could be answered, and the dialogue is sure to continue. It’s clear, however, that design and density are intertwined – and both are key considerations in the planning for San Diego’s best future. Suchitra Mukherjee is a community planner and has consulted with various public agencies on urban development strategies. She is currently pursuing a Master of Architecture from the NewSchool of Architecture + Design. Her aspiration is to transform policies for vibrant, sustainable communities into physical design and, ultimately, reality. Nick Ferracone, AICP, is a Board Member of the American Planning Association San Diego Section and a Program Manager in the City of San Diego Development Services Department.